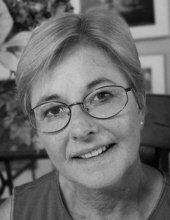 Katherine E. Hedeen (Kate), age 68, of Dayton, Ohio, former resident of Waverly, Iowa, passed away on Monday, October 22, 2018, of pancreatic cancer. She was born in Champaign, Illinois, on March 18, 1950, to Earle and Herta Sparks and was the eldest of five sisters. In college she studied art with a concentration in film, and had a lifelong interest in photography and family documentation. After a career in commercial art, she eventually followed her passion for gardening to become a certified Master Gardener. She worked in landscape maintenance for fifteen years until her death. She greatly valued family and was a devoted mother of two daughters. She was an active member of St. Andrews Episcopal Church. Her energetic and positive spirit will be missed by all. She is survived by her two daughters, Marian Hedeen and Sarah Tasseff, and four sisters, Eileen Byrd, Debbie Jenkins, Donna Stumm, and Laurie Sparks. A memorial service will take place in Dayton, Ohio, in spring 2019. Details will be announced at a later date. Local arrangements and cremation were under the care of Holcombe-Fisher Funeral Home, 147 Main Street in Flemington. For further information or to leave an online condolence, please visit www.holcombefisher.com. "Email Address" would like to share the life celebration of Katherine Hedeen. Click on the "link" to go to share a favorite memory or leave a condolence message for the family.